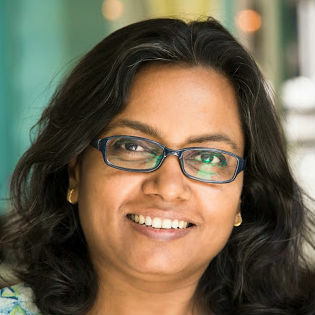 Winter evenings have been dull and boring and we need to perk up the spirits after slogging on the desk the whole day. Weekday evening outings are rare for us but we do indulge ourselves sometimes. 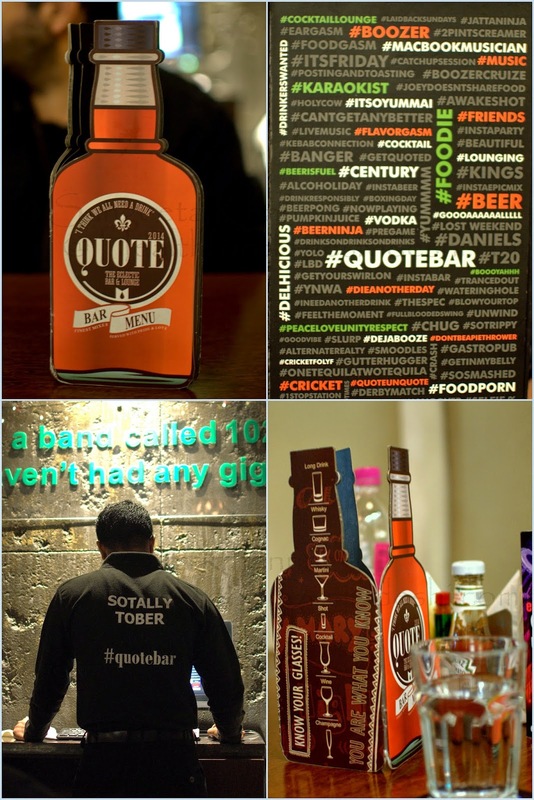 This time it was well worth accepting an invite from Quote Bar. 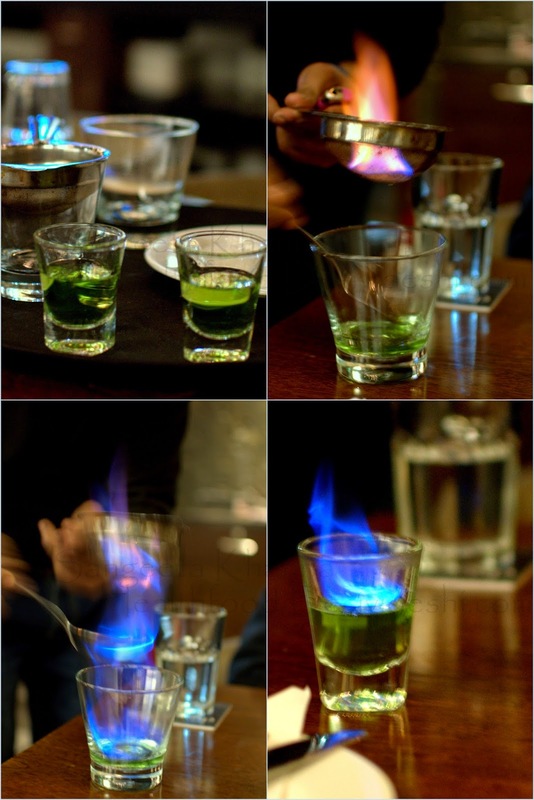 When on a chilly winter evening you are served a shot of flaming Absinthe made right at your table, the dinner looks really promising. We were not disappointed a bit. 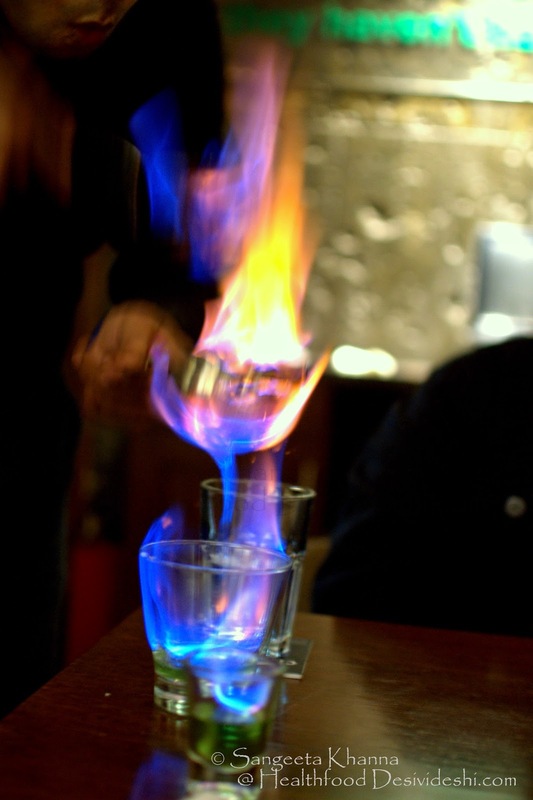 This drink is labeled TNT on the menu of Quote Bar (Connaught Place) but it is neat Absinthe served flaming with sugar on the table, adding a lot of drama to the dining experience. It was really good, both of us loved it. But I strongly felt this flaming drink should be served with a good quality glass straw as the plastic straw was utterly useless dipped in flaming alcohol. Hope the establishment gets my feedback o this wonderful drink. 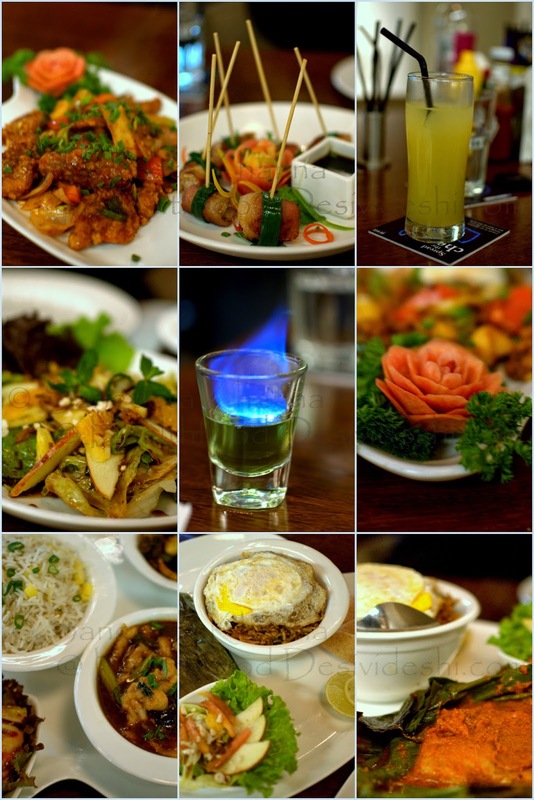 The food is delicious and very creative, covering a vast array of popular cuisines. And does justice to it fairly. We loved the crispy fried fish with spring onions, the fish was a bit firm, not 'melt in the mouth kinda fresh' but the crisp crust doused with oriental sauce was quite good. The lemon teriyaki chicken and bacon roll was really nice too, here also the chicken was a bit hard to bite but well balanced flavours and a really nice way to serve it like lollipops. We ordered an Indonesian citrus salad and this was really really good. Crunchy crushed peanuts, sweet sour and hot sambal ulek dressing, thinly sliced apples, fresh lettuce and citrus bites make this salad really enjoyable. We ordered two platters from Quote Bar specials. A platter of chicken with shitake and asparagus with oyster sauce was really good. It is served with pineapple rice and a side of green salad that makes it a complete balanced meal. The other platter was a grilled fish in banana leaf wrap, served with nasi goreng topped with fried egg and shrimp crackers. We loved the nasi goreng and the shrimp crackers but the fish was not fresh and lacked the taste although the Malay style masala paste was really good. I wish the fish was fresh and soft and had taken the flavours of the masala. Else this platter is a must try. The decor has a youthful spirit and quirky walls, a great place to visit when one needs to perk up or party with friends. The flaming shooters are presented well. My only suggestion is to please bring some glass straws for these shots as plastic is injurious to health when dipped in flaming alcohol. It is a spectacle for sure.